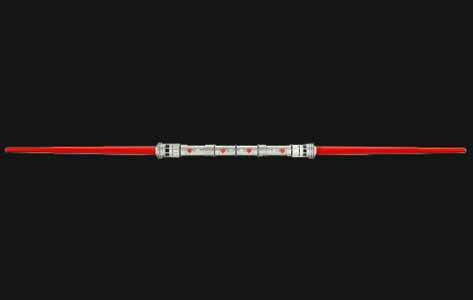 Hasbro's Darth Maul Double-Bladed Lightsaber is a budget range, detailed toy that younger fans of Star Wars will get many hour of usage out of. Unlike more expensive models there's no sound effects or light-up option, but then this is a toy designed more for action than it is sitting gathering dust on a shelf. The plastic blades are collapsible - retracting into the handles, and when you press a button they spring out to full size. You can push one button to release one blade, or both buttons to launch both blades. When both blades are extended it's around 1.5 metres in length. The detail is pretty impressive, as is the size (bearing in mind this is a child's play toy). 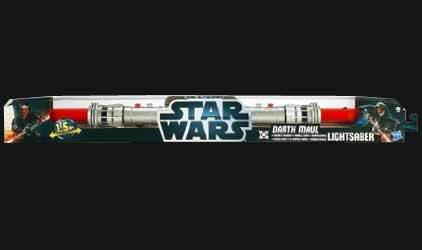 For those that can't afford the more expensive sound and light versions, or want something they can play with a little more roughly, this is a neat addition to your Star Wars collection.